Fodder or animal feed is any feedstock used specifically to feed domesticated livestock such as cattle, goats, sheep, horses, chickens and pigs. “Fodder” refers particularly to food given to the animals (including plants cut and carried to them), rather than that which they forage for themselves in pasture and grazing land. It includes hay, straw, silage, compressed and pelleted feeds, oils and mixed rations, and also sprouted grains and legumes. The fodder system we are focusing on here today is a hydroponically grown, quick turn over, and cost effective system. With many regions of the world experiencing record droughts and peak water becoming more of a concern for many businesses and individuals who own and raise livestock, seeking options and solutions to maintain the health and growth of their animals can be a challenge. Sprouting fodder on site can be a dependable and low cost source of feed and nutritional supplementation, creating a local, on demand feed source that can build great resiliency and independence for homesteaders and those in agricultural industries. The technique is not new and has been used and investigated for many years but has started to see a resurgence in use throughout the world as water and growing issues become more prevalent. As a response to extreme droughts, a number of commercial companies (many in Australia) have been developed. These companies offer large scale systems that are able to produce many tons of fodder feed per day and offer new options for ranchers and livestock producers. Not only do fodder systems use less water than field grown hay, they also offer many other advantages, including higher productivity through increased nutritional value. 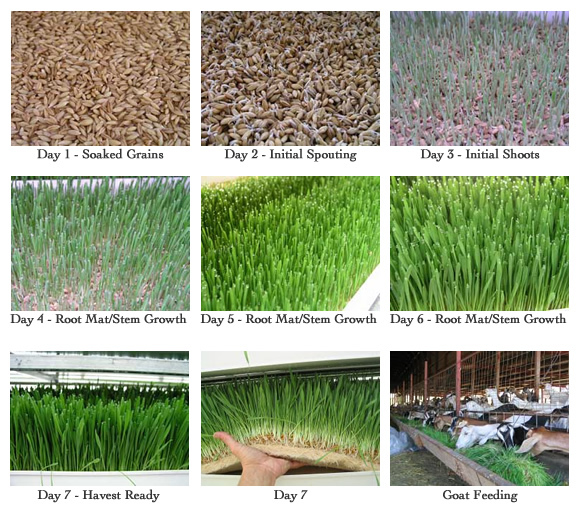 In this article, we will explore the benefits and challenges of small to medium scale hydroponic fodder growing to produce localized feedstock. Here is what the growth cycle looks like for barley grass. The fodder will grow from a dry seed to a 6 -7 inch plant in a little as 6 days. With multiple trays being rotated on a daily basis, once can grow a continuous supply of fresh feed with very little space, power, and water requirements. And the great part is that it is digestible by a great number of animals, from chickens and rabbits, to goat, horses, and cows, this living food can compliment the diets most farm animals. Mold and fungus growth can be a problem. Sterile equipment, a low humidity environment, good temperature regulation, clean water, and good air circulation can all help avoid mold and fungus problems. A one percent bleach solution can be used to wash the grains prior to the initial soaking. This will pre-sterilize the seed. Depending on the sprouting setup – it can be labor intensive to rotate and clean trays and transport the “wet” feed. Seed quality can play a factor in the overall success and quality of the fodder produced. Storage of large quantities of grain needs to be considered in the costs and setup of a on-demand fodder system. Keeping the stored grain from moisture and pests is important. Some systems require power to operate and a lack of power/water in emergency situations needs to be factored in to the setup. When looking at starting a homestead or beginning to raise animals for personal consumption or as a commercial enterprise, the nutritional needs of the livestock being raised will become a key factor in the workload and expense of a setup. Feed availability, quality and price are all continuous concerns. With good nutrition and supplementation at the forefront – other issues of animal care can be reduced and minimized. By growing sprouted fodder – one can provide a great source of nutrition to a wide range of animals (goats, rabbits, sheep, pigs, horses, cows) and have the ability to locally acquire an on-demand feedstock. This feed will improve the health of your animals, reduce your overall maintenance costs, and build more resiliency into the care of your animals. I hope you find this article useful in your homestead setup and overall animal care. As sprouted grains have numerous nutritional benefits for not only animals but humans as well, we are working on a number of articles that will highlight sprouted grains for human consumption.